We had the pleasure of working a total of nine photo booth events for different Target Stores in the DFW area. Target recently remodeled several of their stores, investing around $7 million per store! That’s HUGE! We were excited to see the renovations first hand and we must say, the updates are awesome! When they asked us to be part of their grand reopening celebrations, the answer was of course yes! Our whole Photo Booth Dallas team was out at stores in Arlington all the way to Watuga! Target really knows how to put a party together! They had different attractions at each location. One location had acrobats, cotton candy machines, Spot the dog, food trucks and so much more! It was amazing to see everyone have a great time. Guests that just expected to go shopping were pleasantly surprised as they were greeted by all of the fun things that Target had planned that day. We thank Target and the whole Photo Booth Dallas Team for working nine successful photo booth rentals in one day! 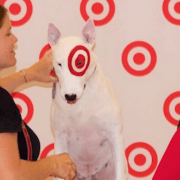 We hope to work with any Target Store again in the future!